Raj Gupta (second from left), with wife Kamla (third from left) and daughter Amita Gupta (second from right) at the dedication ceremony of the Raj & Kamla Gupta Professor of Infectious Diseases at Johns Hopkins University in Baltimore on September 5. Others seen are the inaugural recipient Robert Bollinger (third from right), Johns Hopkins University President Ronald Daniels (left) and Dr. Paul Rothman, Dean of the Johns Hopkins School of Medicine (right). According to Indiaspora Indian Americans have contributed more than $1.2 billion to US higher education institutions since 2000. Photo credit: Robert Smith Photography. Indiaspora launches database to track Indian American philanthropic contributions to American higher education institutions. Indian American donors have contributed more than $1.2 billion to US higher education institutions since 2000, according to a new study by the nonprofit Indiaspora. The amount includes only publicly disclosed donations made to colleges and universities, not smaller gifts that aren’t tracked, meaning total contributions made by Indian Americans could be much higher. The study, which covers the period between January 2000 and August 2018, found that 50 different donors have made 68 donations to 37 universities and colleges. Indiaspora revealed the findings of the study Tuesday, while announcing the launch of its “Monitor of University Giving” database, which keeps track of Indian American contributions to higher education. To put it context, nearly $44 billion was given to US universities last year alone, of which more than $19 billion came from individual donors. According to the Indiaspora study, the number beneficiary of the largesse of Indian American donors is UCLA. Harvard University and Boston University tied for second, followed by University of Chicago and University of Pennsylvania. State-wise, educational institutions in Massachusetts received the largest share, followed by schools in Florida, New York and California. In recent years, Indian Americans have made several high-profile top-dollars donations to US educational institutions. 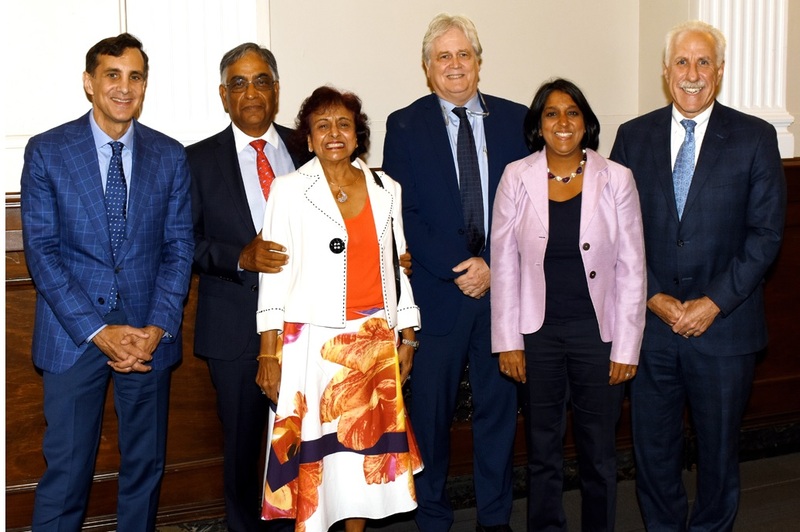 On September 5, Johns Hopkins University’s Center for Clinical Global Health Education dedicated a $5 million Raj and Kamla Gupta Professorship in Infectious Diseases. The inaugural recipient is Robert C. Bollinger. Half the endowment amount was donated by Raj Gupta, a former Chairman and CEO of Rohm and Haas, and his wife, Kamla. The other half came from the Haas family. There were also two pledges of at least $100 or more in the past three years. In September 2017, the Tampa-based Drs. Kiran & Pallavi Foundation pledged $200 million — $50 million in direct contributions and more than $150 million in real estate and facility investment — to the Nova Southeastern University in Fort Lauderdale, FL. In October 2015, Chandrika and Ranjan Tandon announced a $100 million gift to New York University’s school of engineering. Among other prominent Indian American donors to US higher education institutions since 2000 include Texas entrepreneurs Satish and Yasmin Gupta, who donated $12 million to the University of Dallas in October 2013; Illinois entrepreneur Sunil Puri, who made a $5 million donation to Rockford University in 2013; and technology entrepreneur and philanthropist Desh Deshpande, who gave $20 million to MIT in 2002 to set up the Deshpande Center for Technological Innovation. Private institutions receive more than twice as often as public universities from Indian American donors. Private universities receive $5 for every $2 donated to public schools. A total of 47 percent of the gifts are from repeat donors who had also given $1 million or more to either the same or a different university. Business and medical schools are the two most popular targets of Indian American donations. They are followed by India studies and engineering.